Ten travelers meet on a street corner in San Diego. The first has alot to say about Kandinsky and he’s emphasizing every word; the second wants to relate a happy memory of his grandfather, but emphasizes every second word. The third feels the number three has cosmic significance, stressing every third word, and so on to the tenth who is holding forth on the nature of infinities and punctuates every tenth word. 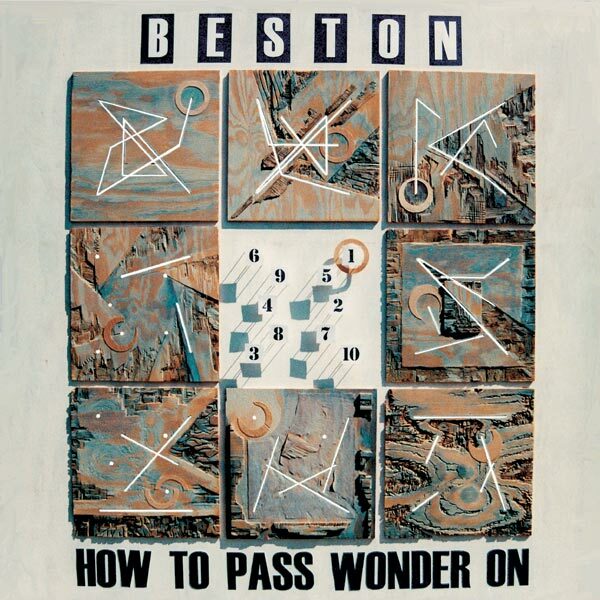 These hypothetical characters would dig Beston’s most avant-garde project, “How To Pass Wonder On” which navigates a mini-universe of meters and meanings over acoustic grooves ranging in influence from Brazilian capoeira music, to Cuban rumba, to American blues, to the Gnawa trance music of Morocco. “How to Pass Wonder On” is a collection of word-songs, each named for the meter (“1” through “10”) in which it was arranged. The conceptual object was to explore the relationship between natural spoken rhythms and metrical or structural rhythms. Though “1”, “2”, “4”, and “8” could all be counted the same, the basic melodic pattern in each repeats according to its meter. Thus each song represented a unique challenge for me in terms of finding an aesthetic compromise between natural and metrical spoken rhythms: I would take a set of lyrics and try to fit it to a meter. Or, put another way, I would try to keep the natural flow of the words, but let the meter bring out its own emphasis. In most cases, the choruses followed as simple melodic interpretations of a line or two from a verse. Once the rhythm of the lyrics solidified, I could then build up musical arrangements around the finished verses, drawing loosely from a lot of different musical traditions to try and match the mood of the words. The most obvious folkloric influence is in the percussion: the music is dominated by the tan-tan (a Brazilian hand-drum) and the cajon (a flamenco drum I picked up in Spain which is also used in the local musics of Cuba and Peru). The painting on the album cover is meant to be a visual parallel to the process by which the music was created. To sum it up: start with something ‘natural’ or ‘meaningful’, superimpose it against a set of related structures to produce a series of pieces, and then enhance the series with color and texture. The pattern of numbers in the center of the painting is the ‘natural’ element: they are actually the song titles in order from top-to-bottom and left-to-right. The squares around the outside show counting systems like meters superimposed on the numbers in the middle. The upper left is a kind of connect-the-dots by one: 1-2-3-4-5-6-7-8-9-10. The second, clockwise, counts by two: 1-3-5-7-9, 2-4-6-8-10; the third by three: 1-4-7-10, 2-5-8, 3-6-9, and so on. By the eighth, the pattern has fragmented into dots because the count is so high: 1-9, 2-10, 3, 4, 5, 6, 7, 8. Lastly, paint and sculptural elements flesh the patterns out, as the musical arrangements flesh out the words and rhythms of the album. In the final analysis, the conceptual element of the project can be thought of as only a vehicle for making music. The variety of meters allowed me to stretch some traditional musics in new directions without plagiarizing them, and the rhythmic spoken word structure gave me leeway to navigate lyrical ideas with more depth than comes easily to melody and rhyme. But, like most artistic endeavors, the goal remained to create something which its audience would find beautiful, or meaningful, or both. The music of “six” has basically a funk backbeat extended to 6/4 so the bar is broken up into threes, 1-2, 3-4, 5-6, with the ‘snare’ on 2, 4, and 6. In contrast, the words tend to be broken up into two lines per bar: 1-2-3, 4-5-6. Between the second and third verse, there is a rumba-like break in which the triangle plays a funky palito pattern in 6. 13 “the madding crowd” This phrase comes from Thomas Gray’s “Elegy Written in a Country Churchyard”. 21 “rising the sun also” From Ecclesiastes 1, in which the passing of human generations is compared to the rising and falling of the sun; it is from this Biblical passage which Hemingway’s The Sun Also Rises takes its title. 26 “two by two”, like the animals boarding Noah’s ark (Genesis 6-8). 37 “words like Grendel diving away” When Beowulf chases the monster Grendel back to his watery lair, he has already ripped off one of the monster’s arms. In John Gardner’s retelling of the myth, Grendel is bested with words. On “three”, I use a major scale with a b5 to produce a kind of dissonance to fit the melancholy of the verses. The triangle plays a 6/8 samba tambourine pattern over the slow 3/4 backbeat. 3-4 “too much alike to be brothers / and one only a wisp” This is a reference to the holy trinity: the ‘wisp’ is the holy ghost. 21 “the truth about clovers” is that there are no four-leafed ones, only three-leafed. 35-36 “the force that through the green fuse drives the flower” is the first line of a Dylan Thomas poem of the same title. The poem expresses confusion, maybe anxiety, because the forces that give rise to life and to death are often the same. 42 “tri-colored noise” All the colors in the visible spectrum can be produced by mixing three colors. 42 “tri-dimensional wreckage” Any point can be located using three coordinates. 48 “too complex to be two”, or somewhat more than two. 49 “almost square”, or somewhat less than four. Most of “four” alternates between minor verses which are in swing time and major choruses in a straight time accented by the Caribbean feel of the electric guitar. Towards the end, the song moves into double-time and the guitars play fast triplet arpeggios characteristic of the guitar bands of Zaire. 30 “sweet honey in stone” This is a reference to Deuteronomy 32:13 – from which the greatest activist female African-American a cappella group in the world also takes its name. I used 9/8, so disconcertingly close to straight 4/4, to increase the jarring effect of the lyrics on ‘”nine”. As in “six”, the interaction of cajon and triangle evoke that between congas and clave in Cuban rumba. 11 “shovel us under at Ypres, Verdun, Stalingrad” is a synthesis of lines from Carl Sandburg’s “The Grass” which Mrs. Venable, my eighth grade English teacher, so lovingly made us memorize and read aloud. 17 “the dog jaw” is a practical joke. You rub your jaw and say something like, ‘man, my dog jaw’s really been acting up lately.’ When the victim asks what dog jaw is, you say, ‘here, you can feel mine right here.’ Then when the victim reaches out a hand to feel your jaw, you bark real loud and snap at their fingers. Then everyone laughs. 24 “slouching through the desert” evokes Yeat’s poem “The Second Coming”: “And what rough beast, its hour come round at last, / Slouches towards Bethlehem to be born?” Lines from this poem have been used a lot in modern literature. The only song without anything resembling a chorus, “eight” speeds up slowly until the climactic line at the end. A lot of tracks of random sounds and percussion were allowed to fade in and out of the mix to give the repetitive riff some variety. 4 “green brick” is unfired brick. 30 “how to call dragons” refers to song “two”. See note on song “two”, line 21-22. 49 “a secret door” This whole song owes a lot to Robert Frost’s Directive which also leads the reader through an extensive imagined landscape to a symbolic secret spot which casts the earlier description in a new light. There are a number of flamenco elements in “five” – the instrumentation including cajon and Spanish guitar, and a reliance on the Phrygian scale – but the underlying groove and cymbal-work is jazz-flavored. In this sense, it follows in the footsteps of other flamenco fusions like Coltrane’s ‘Ole’. A second upright bass track uses the bow to create ethereal harmonic effects. 1 “in the end, smashing the guitar and huddling against the pole” At the end of Woody Allen’s faux docudrama Sweet and Lowdown, Emmet Ray smashes his guitar against a lightpost in a train yard and then collapses against it, weeping and crying, “I made a mistake.” after he loses the love of his life. We are told that he never plays the guitar again. Most of this song is about that scene. 20 “won’t run over the fretboard” See note on line 1. 23 “I made a mistake” See note on line 1. 30 “the pole, the cold ground, the trains” See note on line 1. The musical arrangement on “seven” is loosely based on Moroccan Gnawa trance music, with heavy cymbal-work and the upright bass, played with a pick, imitating the guimbri. I think the fast tempo, ranting vocals, and congo playing recall the sound of the Last Poets. 27 “straightening the bent arms of beggars” When asking for money, a beggar holds his arm straight out. 37-38 “concrete jungle” One of Bob Marley’s best songs describes the harshness and inhumanity of living in the city. 56-57 “number nine” One of the Beatles’ strangest songs, from The White Album. 72-73 “more living than dead” refers to the amazing fact that, as depicted by the shape of the population curve, there are more humans living today than have ever died. 79-82 “the city…out loud” This is an evocation of Carl Sandburg’s poem “Chicago”. 85 “dodging falling air conditioners” Peter Bibring tells me that an inordinate number of people in NYC die each year when accidentally struck by falling window-unit air conditioners (I have not verified this fact). The groove on “two” is based primarily on Brazilian capoeira music: the guitar goes back and forth between 1 and b7 imitating the ‘Angola’ rhythm which the berimbau would traditionally play. At the end, the arrangement speeds up into a samba feel, and the tan-tan plays the part it was designed for. 21-22 “my grandfather and I match-calling dragons / in the backyard” My grandfather, Richard Weesner, did actually try and convince me that burning dried seed pods from the Mimosa tree would call dragons. We even tried it once. 25 “Indian wisdom” My grandfather was a scholar of Native American history and folklore. 51-53 “the burning bush…voice” Moses received his calling when god spoke to him through a burning bush (Exodus 3). how does light work really on us I mean? does green shine spectral sparks at our spleens? with what voice does red’s sheen speak to our hearts? “one” has basically an acoustic hip-hop feel, though the idea of it being in 1/4 can be heard more clearly in the pulsing rhythm of the chorus when the backbeat goes away. A similar chord progression was also used by Joan Armatrading in her song, “Opportunity”. 7-9 “one ear…crescendos reborn” Wassily Kandinsky received much of the inspiration for his non-objective paintings from music. 11 “numbering them” Many of Kandinsky’s compositions were numbered as parts of a series rather than titled. 12 “riding the blue horse” Kandinsky is associated with a circle of artists known as the Blue Rider group, from a magazine in which they often exhibited called Der Blaue Reiter. 51 “a wind over the water” This is an image from Genesis 1:2, also used in song “four”, line 29. “ten” is a slow ballad with a whole step modulation towards the end. The chord progression is I, Vmi, IImi, IVmi6, V7#9. 4 “drawing black lines around my body” refers to the way in which much early modern painting (Cezanne, Van Gogh, Gauguin, Picasso) uses dark outlining to delineate figures and objects in the frame. This has the effect of collapsing the picture onto the plane (decreasing the three-dimensionality of the scene) while strengthening or solidifying the composition. Musically, “zero” is the exception to the other songs because it has no set meter. Instead of allowing the word rhythms to be dictated by the meter, the meter is determined line by line based on the natural rhythm of the words. This means that a line in 3/4 might be followed by one in 7/8 followed by one in 5/4, etc. Also, the tempo goes through some contortions, cutting by a third at the beginning of each chorus and building smoothly back up to tempo by the verse. The music does not stem from one particular genre or another, but the melodic feeling of the chorus owes something to Mindy Smith, a Nashville songwriter. See the original manuscript. 2-9 “their love, a garden…broken, defiled” These lines conjure up imagery from the story of the garden of Eden found in Genesis 2-3. 10 “the aspirant act” Robert Frost in his poem “After Apple Picking” used the apple as a symbol of human aspiration, likening the act of reaching up for an apple to that of reaching for something beyond ourselves. 12 “I am done with apple-picking now” from Frost’s “After Apple Picking”, see note on line 10. 46-49 “remembering their first names…their original thing” As in lines 2-9, these lines conjure Edenic images, but this time with monkeys in the picture – suggesting a sort of synthesis of creation myth and evolution. 62 “coordinates in the real and the imaginary” Imaginary numbers are the square roots of negative numbers. Mathematically, it is sometimes helpful to solve engineering problems by mapping onto the ‘complex’ plane in which one axis is real and the other imaginary. Here, the idea is extended to emotional problems. O in turns of tempest, me heaped there; me frantic to avoíd thee and flee? so where is the sun to be found? will someone tell me now! And pile them high at Gettysburg. Categories: album, How To Pass Wonder On (2001) | Permalink.